While most companies start from humble beginnings and work their way up, the DreamWorks entertainment company actually started with some serious power behind it. Steven Spielberg, Disney chairman Jeffrey Katzenberg and record producer David Geffen came together to form the company in 1994, all but guaranteeing that the company would be a success. Since then this company has come to create such blockbusters as “Shrek”, “Kung Fu Panda” and “How to Train Your Dragon.” DreamWorks has shown no signs of slowing down and is sure to be a powerhouse in the entertainment industry for years to come. One important factor that has helped DreamWorks to obtain its lofty perch is the distinctiveness of their logo. Before many a popular movie, the DreamWorks logo is sure to be seen and that kind of brand recognition is important. If the people in the theater enjoy the movie that comes after then they are much more likely to seek out other DreamWorks movies. Anyone seeking to create a branding empire of their own should consider the lessons of DreamWorks. The first logo came about through the imagination of Steven Spielberg. He wanted a logo that reminded others of Hollywood’s golden age. To that end he suggested the concept of a man fishing while atop the moon. He at first wanted it to be a computer generated image but, in the end, an artist named Robert Hunt was asked to hand-draw the image. It was Hunt that suggested that the man become a boy and Spielberg agreed. As an added bonus, the boy on the moon was modeled after Hunt’s son. As a nod to the three people who had come together to make DreamWorks, the initials SKG were added to the bottom of the logo. This stood for Spielberg, Katzenberg and Geffen, the three original founders. As the company grew, the logo needed to be updated to reflect its growing popularity. While they stayed with the original logo of the fishing boy, they decided to update the logo with the use of computer graphics to give it a more modern feel. This included giving the boy and the moon some updated artwork as well as adding digitally created clouds to give the logo an illusion of depth. The current logo of DreamWorks has stayed true to its predecessors. It too shows the idyllic image of a young boy fishing from the moon with clouds surrounding him. 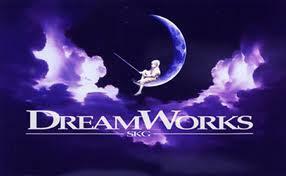 However the “DreamWorks” name itself was changed. Each letter was given a bright color so as to stand out and make the logo that much more visible. Steven Spielberg wanted a logo that reminded people of the golden age of Hollywood and the DreamWorks logo seems to work perfectly in that regard. It’s nostalgic, idyllic and quite popular. This logo is so effective probably because it speaks to the inner child in everyone, of a more innocent time. Anyone who seeks to create their own branding empire should consider the history of the DreamWorks logo and how it speaks to people on an emotional level. I agree that The DreamWorks logo is very outstanding and original. I think it reflects the main idea of DreamWorks company, that produces wonderful movies and cartoons for viewers of all ages, nationalities and religions. I’ve seen many of its blockbusters and “Shrek” is surely one of my favorite ones!